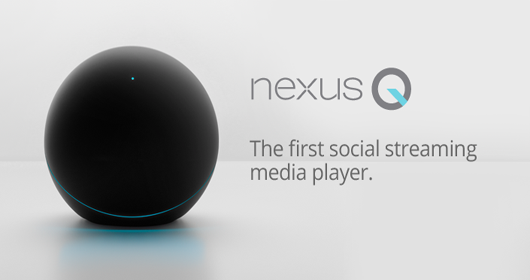 Announced at this year’s Google I/O, the $299 Google Nexus Q is being touted as the “world’s first social streaming media player”. Featuring a svelte spherical design, the Nexus Q is designed to stream media from the cloud straight into your living-room and has been designed as a clear competitor for the Apple TV. The Nexus Q is essentially a small Android powered computer, running Ice Cream Sandwich and coming with 1GB of internal RAM and 16GB of on-board flash storage. It’s Wi-Fi, Bluetooth and NFC enabled, allowing you to control the device from your Android smartphone or tablet using Google Play. You can stream YouTube to your TV via the Google Nexus Q, play your favorite music on your stereo or watch the latest TV shows and movies. Doubling as an amplifier (25-watt), the Google Nexus Q also allows users to plug in their own speakers to the device. The Google Nexus Q has been envisioned as the next generation of party jukebox – where anyone (with an Android device), can send music to the Q, developing a real-time party playlist. You can hook up the Google Nexus Q to your home theatre or stereo via the optical audio or HDMI cable, and control the volume via your Android smartphone or tablet or by simply sliding your hand across the touch-capacitive surface. Google are accepting pre-orders now for $299, with the Google Nexus Q due to ship in 2-3 weeks.